Whether your decorating taste is traditional, transitional or contemporary, the designers at Linda Dickerson Interiors will be pleased to work with you to capture the exact look and feel you want for your home. 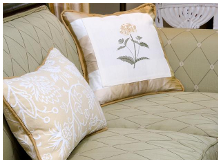 If you have a swatch of fabric around which you wish to create a room, we can help you! Or, we can design around the furniture and fabrics you have already and create an entirely new feel to your existing home! We believe in timeless design over fleeting fads and we can easily develop a design scheme that can be implemented in stages. We are committed to each of our clients and we will go the extra mile to make your decorating vision a reality. This is our mission. This is our promise. Also, if and when you move, we can help you! Whether you're moving into a larger home or a smaller space, we will implement floor plans using existing or new furnishings. We can help you determine beforehand which furnishings should be moved; as well whether carpets, rugs, window treatments or other interior elements should be replaced, recovered, or updated. We will also help arrange the furniture once it has arrived, place accessories and hang pictures, so that your new home quickly becomes a reality. If you've ever had work done on your home, you know how difficult it is to find true professionals who take pride in their craft. Fortunately, through the years we've developed a solid working relationship with a list of seamstresses, upholsterers, wallpaper hangers, drapery and carpet installers, painters, and faux finishers who are not only trustworthy and reliable, but experts in their fields with standards as high as our own. CLICK ON Projects, Before & After, and/or Showhouses on the RIGHT COLUMN to view our work!